The TKI is popular beyond the confines of negotiation classes. Indeed, it is one of the most widely used instruments of its kind in the world. 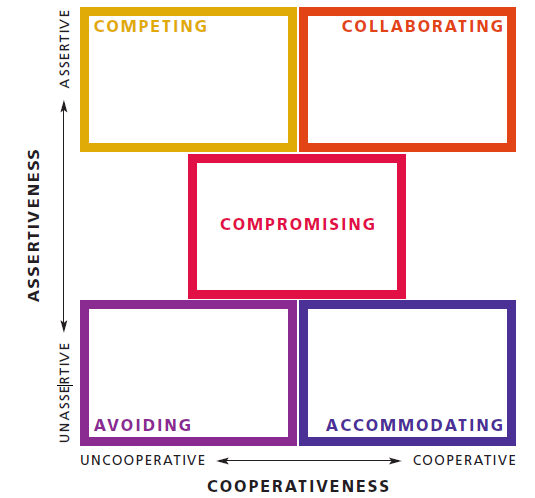 It basically scores one's negotiation style in five domains: Competing, Collaborating, Compromising, Avoiding, and Accommodating, although it looks like these are placed on just two dimensions Assertiveness and Cooperativeness. Has the TKI been [co]related to the Big Five or some other more general (i.e. not simply focused on conflict-resolution) personality model? Browse other questions tagged personality io-psychology big-five conflict or ask your own question.